The story of the Bethel Memorial Methodist Church attack in the words of the rev. Simon Bashir. First the shots in the compound, then "the people hit the head that collapsed on the banks". The son of Salman Taseer: "Death clinics supported by internal extremists and financed by the collection of taxes from the victims themselves". Lahore (AsiaNews) - “Suddenly I heard the firing in church compound. The worshippers panicked and cried loud for God’s mercy. Seconds later, the windows shattered with explosion at the door. Some people were injured with ball bearings from the bomb. Those who were hit in the head collapsed on church benches,” says Pastor Bashir speaking to AsiaNews. 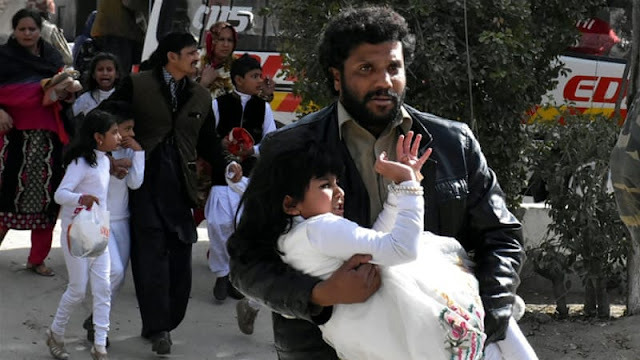 When two suicide bombers stormed into the Bethel Memorial Methodist Church of Quetta, capital of south western province, Balochistanch province, Pastor Bashir was opening the altar gate to distribute communion. (see video). Nine worshippers, including four women were killed and 57 were injured when two suicide bombers attacked the Methodist church yesterday. The building, riddled with bullets, has been sealed by the authorities. Pastor Bashir held the funerals of the victims this afternoon. “Thanks to our young volunteers and police guards, the terrorists could not enter inside the church hall packed with more than 400 people, including 80 children from Sunday school. We are still waiting for government representatives, Balochistan Chief Minister Sanaullah Zehri is expected to meet us today,” he said. The tragedy has dampened Christmas celebrations across the country. The Cecil and Iris Chaudhry Foundation CICF cancelled the annual Christmas program of the CICF Education Center in Youhanabad Lahore scheduled to be held today. “We are heartbroken, hurting and very angry, the state of Pakistan has once again failed to protect the lives and property of its citizens. We demand of the government to hold the perpetrators accountable. How many more lives can we lose? How many more families need to be shattered?” stated Michelle Chaudhry, president CICF in a press statement. Shaan Taseer, son of slain Punjab governor Salmaan Taseer, also condemned the attack. The Muslim governor was assassinated in 2011 for criticizing the blasphemy laws while helping Asia Bibi, the Christian mother jailed for insulting Prophet Muhammad. “For any of my friends still suffering from a national ostrich syndrome thinking these well orchestrated attacks such as the #QuettaChurchAttack are the work of an outsider (RAW, CIA, Mickey Mouse or Kim Kardashian), I post a link to a letter from the LeJ declaring their involvement in such genocide and promising more”, he shared on his facebook page using cover photo of the Christmas tree and broken furniture at Methodist Church of Quetta. “Continual systematic and coordinated attacks like this are made possible because of a well funded and well protected infrastructure of recruitment and indoctrination clinics accross Pakistan, such as Dar Aloom Binori Town Karachi, Akhora Khattack KPK and Laal Masjid Islamabad. This network of murder clinics does not exist in the murky shadows of international espionage and subterfuge, but in broad daylight in Pakistans cities and is protected by Pakistan's police and paramilitary forces, paid for by the taxes collected from the very people they murder. The unit commanders of these clinics like Sami Ul Haq and Abdul Aziz [imam of Islamabad 'red mosque ' that calls for the Talibanisation of Pakistan – ed],are tied at the hip with all three mainstream political parties.” “It is an insult to our national intelligence to think that this infrastructure of genocide existing in full view of the nation, openly defended and apologised for by our civil and military leadership, is the machination of an outside power. The self delusion would be the equivalent of Germans during the 3rd Reich believing Auschwitz was an Anglo French conspiracy,” it concluded.